The next couple of weeks are going will be very busy for Music Generation Louth. 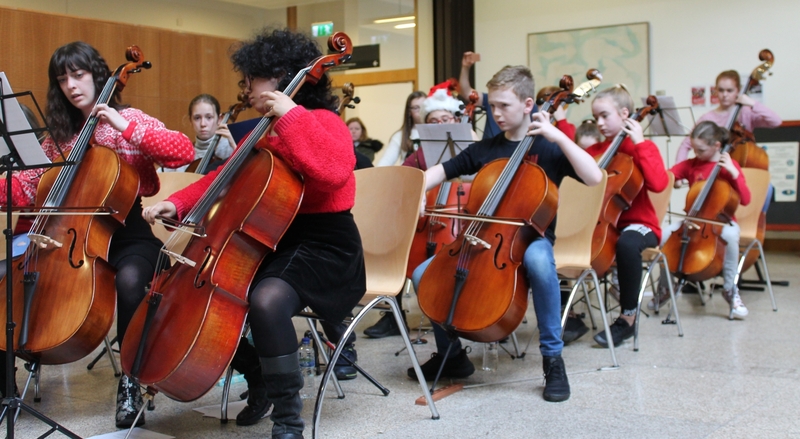 As the season draws to a close for the MGL String Orchestra Programme, they will host a wonderful afternoon showcase concert at St.Nicholas’ Church of Ireland at 1pm on Saturday 6 April. The performance will feature First Strings, Junior and Senior Strings Orchestras. The exceptionally high standard of these ensembles is in no small part due to the skills, dedication and leadership of local musician leaders Jayne Graham, Clare Sweeney and Helen McArdle. Following the showcase the strings programme will be on break until September when we would be delighted to welcome some new members. “Our Saturday strings programme provides an affordable, top quality training opportunity for young musicians to develop their skills as orchestral string players. The initiative started in 2012 and since then has gone from strength to strength. It not only achieves amazing musical results but very importantly gives a strong social dimension to these young musicians' musical study which otherwise would be missing”, said Gemma Murray, Music Generation Louth co-ordinator. Sunday April 7 will see the first of the ‘Sundays in Spring’ Concert Series 2019 in Carlingford’s Heritage Centre. Music Generation Louth is thrilled at the invitation from concert series artistic directors Zoe Conway and John McIntyre, to showcase the talent and hard work of a number of young musicians engaged in MGL programmes. Performing at these fantastic concerts are the Ní Mhaoláin Sisters (Classical String Trio), Mc Caul Family (Traditional Group), Gleoite (Traditional Group) and one of the many bands from the MGL Pick up and Play Programme who will be first up and thoroughly looking forward to performing support to The Four of Us (Sold Out). The subsequent concerts will feature world renowned artists Mairead Buicke and Anthony Byrne, The O Connor Family, Laoise Kelly and Tiarnán Ó Duinchinn, Triona and Maighread Ní Dhomhnaill. During the Easter school holidays the Music Generation Louth Harp Ensemble, will once again welcome world renowned harper Máire Ní Chathasaigh to Dundalk. Máire has been working with the ensemble to create some exciting arrangements for performance at the Cairde na Cruite, International Harp Festival in Termonfechin. This will mark the third year of the ensembles involvement in the Festival, where they will perform in Drogheda’s Tholsel on Monday 1st of July and in An Grianán on Wednesday 3rd of July. The MGL Schools Trad Orchestra Collective will meet for the 2nd time this year during the Easter break. These young musicians have been learning music through MGL’s school strings programmes across the county. The Orchestra’s debut performance took place on the Gig Rig at Fleadh Cheoil na hÉireann, Drogheda in August 2018. It was a wonderful success, especially in how it engaged the local children with the activities of the Fleadh in a very exciting and social way. The children will meet up again and play music with their new musical community of friends during the summer, and will continue preparations for a return to the Gig Rig at Fleadh Cheoil na hÉireann in Drogheda in August.